I don’t believe in God. At least I don’t believe in the Christian conception of an eternal, all-knowing, all-powerful, single-entity god, ready to send me to eternal perdition if I don’t toe the line. But I am spiritual, and I do believe in karma. And compassion, particularly compassion. In fact, the older I get, the more I believe in the power of karma and compassion, and the more I try to live my life in accordance with these principles. And I think events over the past couple of days really show why. Last night, I decided that I would leave Zacatecas this morning. After all, I’ve been here since Thursday afternoon, and I’ve nearly walked myself to death, trying to see virtually every street in the city. It’s time to be sitting in the car for hours at a time again, letting my blisters and muscles heal. Yesterday, I also visited Guadalupe, the city immediately to the east of Zacatecas, and felt like that was my little side trip. And on the way to Guadalupe, a very strange thing happened. I pulled into a Pemex to fill the tank. Since I’m a paranoid type, I never hand the key to the attendant to unlock the filler door. I always either unlock it before I get to the station, or I step out of the cab and unlock it myself. I know this is borderline crazy, but if I lose my keys, it’s basically a disaster. So I pulled into the Pemex, stepped out and unlocked the little door so the guy could fill the tank. I then unlocked my camper, and pulled out stuff to wash the windshield, and went about that task. Once the tank was full, the gas cap was nowhere to be found. The attendant, José, and I had a long discussion about it, him thinking I must have taken it off and put it in the camper, and me saying that he must have misplaced it, and it was really his responsibility since he had filled the tank. But to humor him, I searched the camper, and then the grounds of the station. He rooted through his little storage area, the trash, and everywhere else he could think of. Finally, he went to his own car, pulled off his own gas cap and gave it to me. While I wasn’t exactly comfortable with this, I figured that my cap was surely around there somewhere, and soon enough he’d find it and we’d be even. On my way back from Guadalupe, I stopped by the Pemex again, but no luck. The cap was still missing. I promised José that I’d make a super-thorough search of the camper later, but I doubted I’d find it as I was quite sure he had removed the cap. We were at a draw, though I did have his gas cap. As I drove off again toward my hotel, I really wondered about this weird situation. While it was happening, my suspicious side worried that it was some kind of scam to distract me while someone stole stuff out of my truck. For that reason, while we were searching for the cap, I wore my backpack with my camera and laptop within, and had my phone, wallet, and passport in my pocket. The camper was locked, so there really wasn’t anything to steal there. Further I tried to keep a close watch on everything that was going on. But at the same time, José seemed like a really nice and honest guy, and I could tell he was trying his best too. Giving me his own gas cap was above the call of duty. Despite thinking it over and over, I couldn’t resolve in my mind what had happened, but I suspect one of the two guys at the pump when I arrived must have grabbed it. So I put it out of my mind, still feeling a bit bad about having José’s gas cap, but I figured he’d have an easier time replacing it than I would. This morning I woke up and thought to myself, “Kim, why the hurry? You still haven’t seen Chicomóztoc or Jerez, and seeing such small and out-of-the way places is precisely why this is a road trip in your own truck rather than an airplane/bus combination. Stay another day.” So I paid for another night and set out for Chicomóztoc or “La Quemada,” an ancient ruin about 50 KM from here, with the plan to see Jerez later in the day. 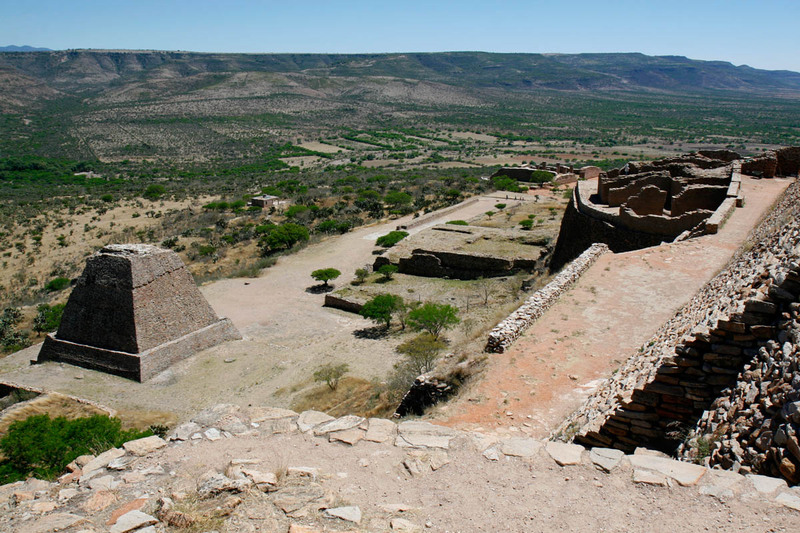 I spent a couple of hours climbing up and down Chicomóztoc, and it was an amazing experience, though an incredibly challenging site physically. I had to climb dozens of stairs that were 12″-18″in height, clamber over rocky inclines, and hike about 4 km. According to INAH, the vertical rise of the site is 150 meters, or almost 500 feet, which I don’t doubt. I’d recommend this site, but it’s not for the out-of-shape. After I literally felt my ears burning from the intense sun, I hurried the last stretch to the top, and then descended as rapidly as I could, hot and tired, but happy I’d made the effort. 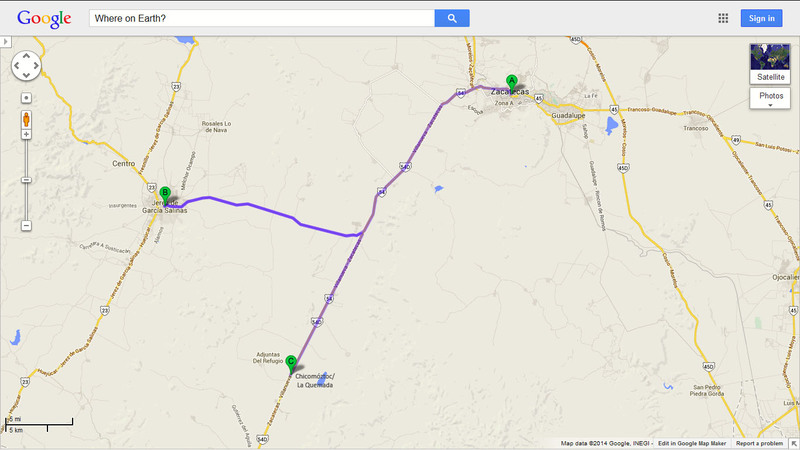 From there, I drove to Jerez. And just as I entered town, I saw an AutoZone. Still feeling bad about having José’s gas cap, I pulled in to see if I could get a new one for less than the $35 USD I imagined the Toyota dealer would want. As it turns out, I could, and it was only 99 pesos or about $7.61 USD. A bargain compared to a guilty conscience, so I snapped it up. As I was getting back into the truck, I heard someone with a Southern California accent, say in English, “Hey, are you from Massachusetts?” I could hardly believe my ears. 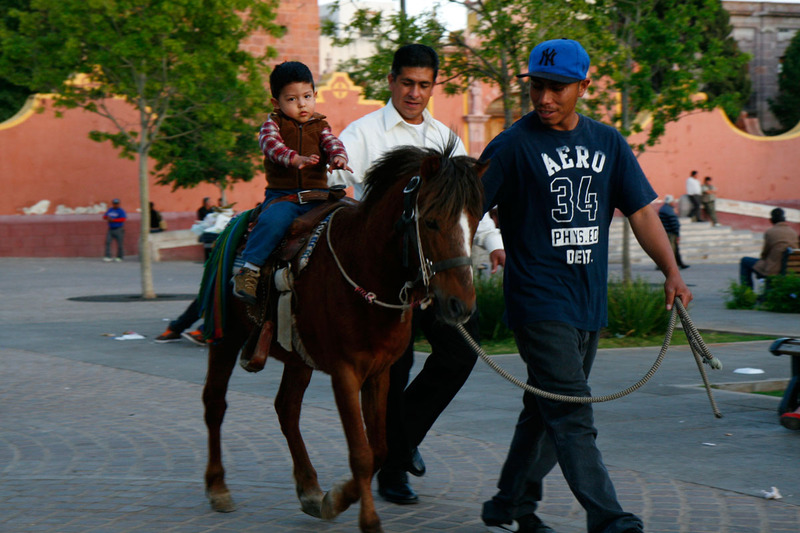 If there aren’t any gringos in Zacatecas, well you REALLY don’t expect them in Jerez. I looked around. And there was a young couple getting out of a white Toyota pickup. We started talking. They had some weird rattle in their truck, and a mechanic had told them it had something to do with the steering. I told them about my mechanical exploits, and offered to take a look. I also mentioned that I had a full box of tools in the camper, and would be happy to help in any way I could. Janet said, “You must have been sent by God to help us.” I kind of chuckled at this, but we looked under the truck, and then went for a spin together so I could hear the rattle. They needed a rubber steering bushing which mounts the steering box to the frame, something that AutoZone likely wouldn’t carry. But we went inside anyway to see. No luck, but I did tell them that it was something they could live with for a while without worrying too much. Meanwhile, I told them about my adventure, and they told me about theirs. Isaul and Janet (not their real names) are a young couple, late 20’s, from Southern, CA. They’ve decided to get out of the American rat race and do something else. They’ve sold everything and have now lived here for about six months in a small town of about 2,000 people in a house owned by Isaul’s family. Since I’m fascinated by people who drop everything to do something “crazy” like moving to Mexico, I immediately wanted to know more, and suggested we have lunch together. They agreed, and since they know Jerez, I followed them to the Centro Historico. We parked near the mercado, and went in for comida casera. There we all just kind of hit it off. I was fascinated that they had decided to chuck it all in and live a totally different life. Janet is learning Spanish, and they are working to open a café in their little town. Isaul is finishing a degree online. They both are excited about living some place where people have a real sense of community, where they gather in the plaza to see and be seen, and to live where people don’t just work, watch TV, sleep and repeat. This is precisely what appeals to me about Mexico too. So we ended up having about a two-and-a-half hour lunch, and talked about their adventures, my adventures, learning Spanish, life in Mexico, photography, and all kinds of things. And I feel like I finished with a couple of new friends. Was this karma? Call me crazy, but I feel like my effort to get José’s gas cap back to him created the good karma that then led me to meet Isaul and Janet. Because if I hadn’t stopped in that AutoZone, I would have missed the experience of meeting these two wonderful people. And they must have done something good too (besides be so nice), because I picked up the tab. (All of 200 pesos, LOL.) And José? I brought him his gas cap a couple hours later, and he was happy to have it back. La Quemada looks lovely. Has been years since I haven’t been there. Of what I remember, the last time I was there was back in the mid 90’s when I was about 2/3 years old it so happens. Hola KylePirate! I loved La Quemada. I had the place nearly to myself, the ruins were fascinating, and I had a great hike to the top. My only regret? That I left my hat in the truck. Saludos and thanks for stopping by! Joanna, I really felt like that was a special day. Thanks for commenting. Saludos! Kim! We were thrilled to have lunch with you and adore your writing 🙂 You could not have described our experience any better and we were just as elated to have met you. We hope to see you soon and hope we get lucky again to have lunch with you! Hi Jenn! Thanks for stopping by the blog and leaving a comment. I totally agree with you, running into each other was one of those wonderful providential things. I hope we can meet up again some time soon. Saludos! remember your long ago post of mexican words not easily translated into english? Well, how about Karma? Not really an american english word for the concept, but that concept is embedded deeply in our culture/group think….almost as deep as how we like to root for the underdog. Wish we had an american word for karma, but do you know the mexican term? Cuz I’m a believer. And a reader of your travelogue…..i like posts that start out kinda rambling in style, unconcerned about form and cleverness, just trying to convey the sense of the day. Hi Dana! Yes, I totally remember that post. In fact, to this day it gets 20-40 hits a day, rain or shine. It’s now one of the top hits on Google if you search for “Cool Spanish Words” or “Untranslatable Spanish Words.” This kind of astonishes me every time I check it. As for karma, the word is the same in Spanish, or it’s equally borrowed from Hindu or wherever it came from. Thanks for the kind words on the posts. I’m enjoying making them and the interaction almost as much as the trip. Saludos! My wife recommended your blog a couple of days ago, and I’m loving it. I’ll be following along, living vicariously through your travels. 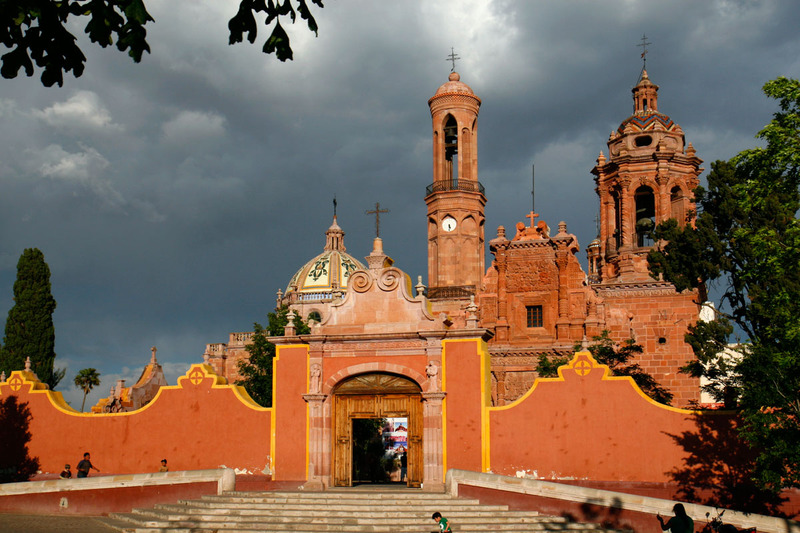 I love the shot of the cathedral in Guadalupe under the dark clouds. Hi Ken, Thanks for stopping by and making a comment. At this very moment, I’m in a hotel in San Luis Potosí, wondering what to make my next post about. I literally have hundreds of photos just of Zacatecas, Guadalupe, Jerez, and Chicomóztoc. I’m the kind of person who snaps, and snaps, and snaps. And the fact of the matter is that for ever 30 or so photos, I’m lucky to get one or two good ones. Thanks for the kind words, though. I will try to put up some more pics. Saludos! I’m so sorry to hear you’re so nervous at the Pemex stations.. I just open the tank from inside the car – have them fill the tank or put 200 pesos in and tip them when they finish cleaning the windshield. I’ve only had one incident, in Monterrey, where they played a game with the tank that shorted me 100 pesos worth of gas. For all the tens of thousands of gallons of gas, I find them to be helpful, pleasant and courteous. Glad you’re going with the flow as the days evolve rather then trying to follow a grand plan, which in Mexico would be tantamount to creating STRESS. Enjoy. Hi Barbara, you know? I think you may be on to something about stressing out. I wish I could open the tank from inside, but the truck predates that particular feature. Thanks for stopping by. Saludos! How long are you planning to be on the road for? Hi Simone! I need to be back in Boston at the end of May. Thanks for the kind comment. It’s been a marvelous trip so far. Saludos! I’m already starting to feel like my time is limited. Six months of this (if I could stand it, what with all the driving and packing up again) would really feel like plenty of time. Truth be told, no. I’m not working much at all. Just monitoring stuff, and hardly even doing that. Just dropping by to tell you that I am really enjoying your road trip and the pics you are sharing. I probably missed it somewhere, but do you have a final destination or are you spending your time driving on a whim, so to speak? Hi Cat! Thanks for commenting. My initial plan (which has not survived contact with the “enemy,” LOL) was to make a beeline to the Yucatán, and then work my way back slowly. But, alas! 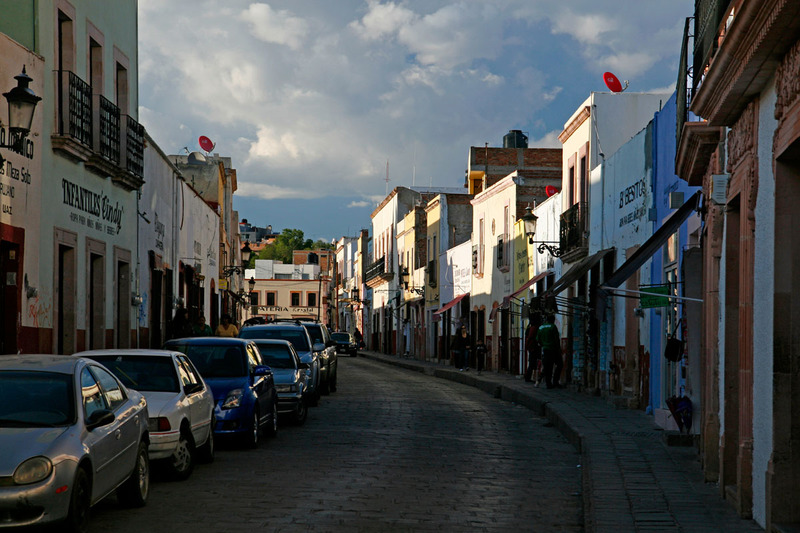 I couldn’t keep up the pace of driving, and stopped in Zacatecas with the idea of spending an extra day or two recuperating. Now I’ve been here nearly a week, and I may not even leave today. So this is very much a “chef’s whim” kind of trip. Saludos! At the leisurely pace at which you are progressing southward (and I thoroughly approve), I may be in Mexico City by the time you get there. Hope that we can meet! Continued safe and happy travels. Hi Bill, I’d love to meet up. I just landed in San Luis Potosí and am only planning to spend the night. But I would very much like too meet up. I’m checking my email every day too. Saludos! So you did make it to Chicomoztoc! (meaning “the place of the seven caves), although the people in Villanueva, my father’s hometown, call it La Quemada). I was reading yesterday that, according to unconfirmed legend, seven tribes parted from Chicomozctoc in a pilgrimage to what now is the Valle de México: Xochimilcas, Chalcas, Tepanecas, Acolhuas, Tlahuicas, Tlaxcaltecas, and Mexicas — they all spoke Nahuatl. It’s really weird how your gas cap just vanished, and while I’m not inclined to believe that Jose stole it, if any of the other two guys did it then he was very naive or just irresponsible for letting that happen. Fortunately the story had a happy ending. This trip of yours is like a novel, and a very good one I can see. You must have been a very good guy all of your life because the Universe is with you, sending good people and new friends to help you along the way. Hola Tino! You know, I may be calling the ruins the wrong thing. “La Quemada” is probably the official name. Chicomóztoc is the (mythical?) place where the Aztecs stopped on their wanderings before they made it to what is now Mexico City. 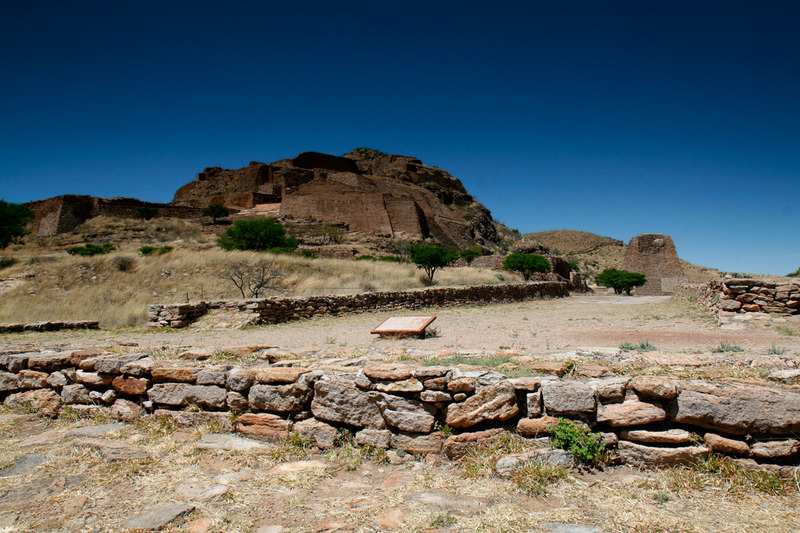 A number of archaeologists think that La Quemada could be that place, but as with everything else about the place, little is known with certainty. And thanks for the kind comment on my karma. I do feel truly blessed, and try to spread those blessings through the universe as much as I can. Saludos y abrazos! But then again, for your five peso tip, you could ask the gas pump guy to clean your windshield. They do a good job as do (surprisingly) the guys with the squirt bottles at red lights. And they will do it for one or two pesos. It sounds like there was a scam in the makings there somewhere, we just can’t figur out what. Croft: I had some particularly tough dead bugs on the windshield right in front of my eyes, but I think you’re right. I’ll let them do it next time. Saludos and thanks for commenting. 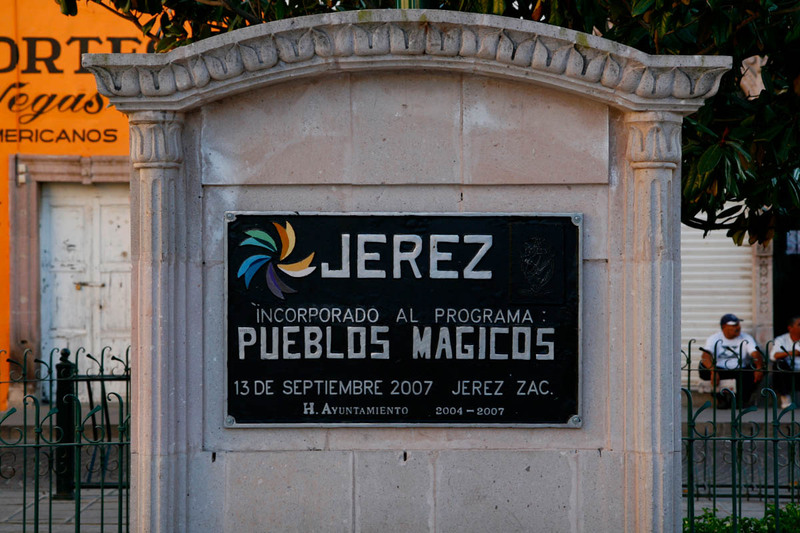 Oddly, what Gringos do collect in that end of Mexico, from what I have read and heard, are precisely in Jerez, not Zacatecas. Why? I have no idea. As for getting gas, I always get out of the car, open the gas tank, and stand there till all is done. Do chores at another time or away from the pumps. Felipe, that’s interesting. There was a very brief write-up about Jerez in my Lonely Planet Mexico Guide, but aside from that and what I saw, I know next to nothing about the place. I’m debating whether to write a post about it as it was lovely, and I have some more very nice photos. Your advice on gas is well-taken. Saludos. P.S. 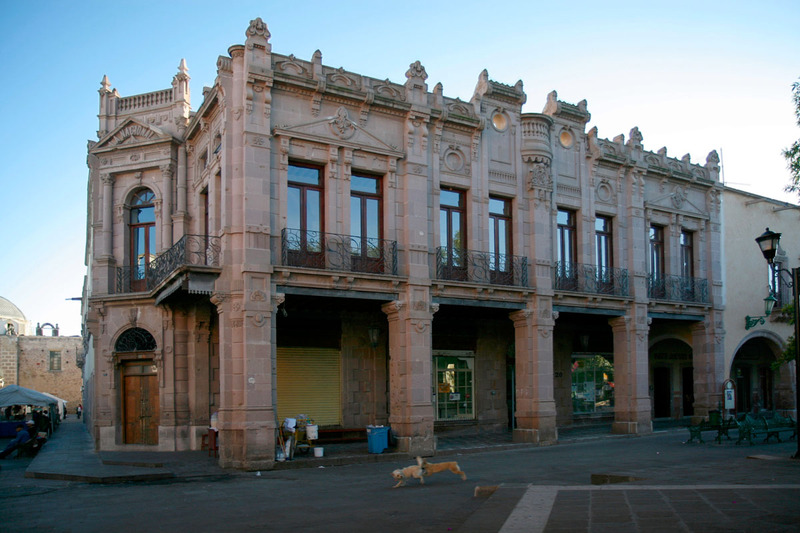 I’d imagine that Jerez is much cheaper than Zacatecas, and many of the buildings are just as beautiful. Plus it’s flat, so if you’re older this is probably an advantage. Every episode–a pleasure to read. You start my day with a smile. Hi Christine. Wow! What a nice comment. Thank you so much. Saludos! Providential experience designed by fate or God – the gas cap – stolen by the hombres you mention – part of the Mexican experience. Hey John! The gas cap thing just struck me as plain weird. I was joking with someone later that this was going to set off a chain of gas cap thefts as it became a sort of game of musical chairs with the entire local population of cars one gas cap short. But the story turned out well, and no crime wave has been set off, LOL. Saludos. Meeting people on the road: the sprinkles on the cupcake. Norm, I feel blessed to have met the people I’ve met so far — Tino, Enrique, Isaul and Janet, among others. It really makes this adventure more traveling and less tourism. Saludos! Lovely story, and, yes, it often seems that things happen that go beyond sheer coincidence. Hey Bill! The amazing thing I’m learning is the more I work on my karma, the more of these things are happening to me. I’d also count meeting Tino into that whole karmic equation. Thanks for the comment. Don’t you just love it when things like this happen?! It keeps me believing that everything happens for a reason. Thanks for sharing – my very early day has started off with a smile. Hi Barbara, That’s totally it, isn’t it? I feel blessed. Thanks for your comment. Saludos.